Kiki (Kiki O.K.) Kogelnik, Orange Naked Woman, page from the book 1¢ Life by Walasse Ting. (Bern: E.W. Kornfeld, 1964). The Baltimore Museum of Art: The Ryda Hecht Levi Collection of Illustrated Books, Bequest of Ryda H. Levi, Baltimore, BMA 2009.42.21 © Kiki Kogelnik Foundation and © 2017 Estate of Walasse Ting/Artists Rights Society (ARS), New York. I was fortunate to handle this rare and fragile objet at the invitation of Rena Hoisington, a curator at the Baltimore Museum of Art, where she mounted the current show “Off the Shelf: Modern and Contemporary Artists’ Books.” The extensive range of artists and writers includes, among many others, Grace Hartigan, Picasso, Frank O’Hara, Ed Ruscha, Kandinsky, Susan Howe, Mayakovsky, Barbara Kruger, Robert Creeley, Kiki Smith, and, of course, the master of the artists’ book, the Swiss Conceptualist Dieter Roth. Equally wide is the breadth of approach: from Ruscha, there is an edition of Twenty-Six Gasoline Stations, the photos printed on an accordion-folded sheet in the order they appeared on Route 66, going west to east; from Barbara Kruger and Stephen King, a large-format volume with a stainless-steel cover and an embedded digital clock; from three authors—Pasolini, Luisa Famos, Andri Peer—and the artist Not Vital, a series of poems written in Rhaeto-Romansh (the national language of Switzerland) and printed on pages custom made from cedar bark that sport attached objects, such as a saw blade. The rich variety of constructions and materials, as well as the methods of representing text—thickly rendered in paint, printed in chaotic typefaces, scrawled across images—beckons the viewer to reach out and touch. If there is a single operating instruction for any book, it has to be “Turn pages.” But the art part of an artist’s book makes exercising that common function a privileged experience. Like most paintings, prints, or sculptures, these books are inherently delicate and typically produced in limited editions. Curators can’t just set them out on table with tiny chains like they often do for exhibition catalogues; museumgoers are restricted to one or two (presumably well-chosen) pages under glass, with no opportunity to touch, for instance, the woody grain of that paper made from cedar bark or graze the metallic coolness of Kruger’s cover. 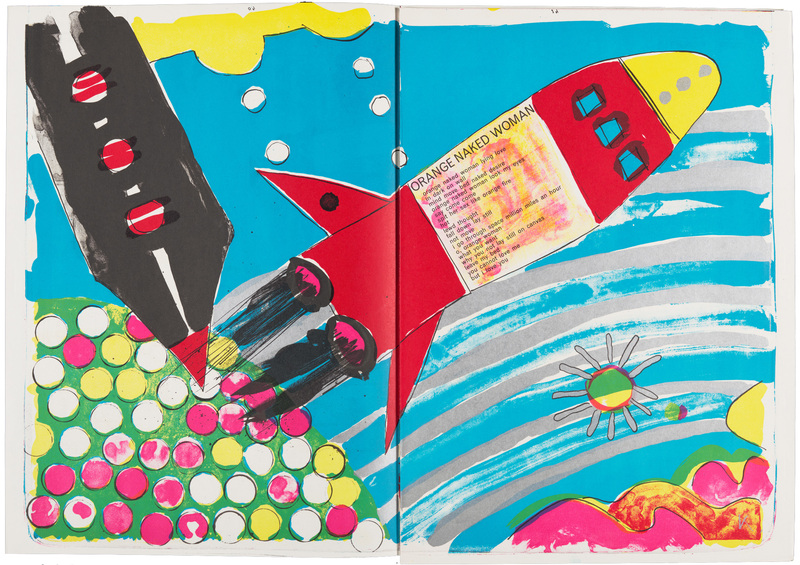 One of the books on display is a beat-up suitcase that Dieter Roth filled with six enlarged and laminated lithographs based on postcard images of London’s Piccadilly Circus that were silkscreened over with his abstract designs. Straightforwardly titled 6 Piccadillies, the piece obviously possesses qualities of a series of prints, but also sculpture (one is overlaid with iron filings), a book (you open the case to find “pages”), postcards (meant to be written on, stuck on walls), and, well, luggage (the bag is ID-tagged for travel). These elements compete within our response, suggesting as they do both ready utility and restrained regard, even as we are guided by the artist’s comic intent, a joke about the function of art that reaches back to Marcel Duchamp’s Fountain. Francesco Clemente and Alberto Savinio, pages from the book The Departure of the Argonaut, 1983–86, published 1986. The Baltimore Museum of Art: The Ryda Hecht Levi Collection of Illustrated Books, Bequest of Ryda H. Levi, Baltimore, BMA 2009.23. © Franceso Clemente/Courtesy: Mary Boone Gallery, New York. 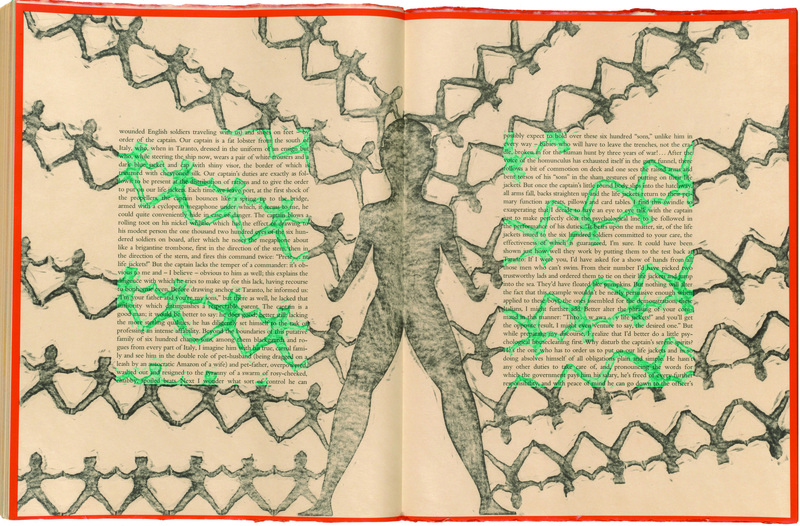 A similar jest emerges from an encounter with another book in the show, a collaboration between Francesco Clemente and the Italian author Alberto Savinio titled The Departure of the Argonaut. Clemente’s lithographs cover the entire page, often obscuring Savinio’s translated account of his experiences in and around the Mediterranean during World War I. The text references the Greek myth of Jason and the Argonauts, and the imagery—at least the spread on view—depicts a seemingly heroic human figure who bestrides the pages, the gutter neatly bisecting the body. Even if not encased in a vitrine, the book would be a difficult one to peruse: it’s enormous, measuring more than three feet in width when open and more than two in height. Surely not intended for the beach or bedside, the book calls to other employments: the corporeal image and overall capaciousness may invite you to slip into its pages and wrap them around you like a cloak. But reading—in any typical sense of the activity—isn’t easily accomplished; this book subverts its very nature. Our reaction to these artists’ books moves along the continuum between seeing and reading. Included are Barry Moser’s wood engravings for Lewis Carroll’s Alice’s Adventures in Wonderland and Mark Twain’s Adventures of Huckleberry Finn, both of which could be said to fall into the more common category of illustrated books. These images serve to enhance the text, to make our reading experience more literal, more detailed, and perhaps more comprehensible. (Of course, many argue that such visual aids, like film adaptations, in fact encumber the imagination.) This sort of book—at least in its mass-market edition—is meant to be handled and read, its images checked against our own visualizations. When the art part of the book—the possessive in artists’ books is telling—becomes increasingly salient, the experience of the text can become subordinate to the experience of the visual and even end up almost incidental. 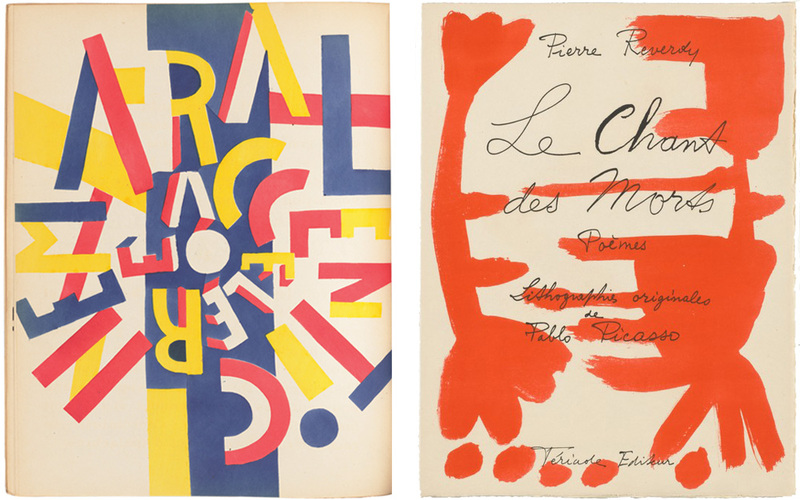 (In The End of the World as Filmed by the Angel of Notre Dame, Blaise Cendrars’s words, when exploded in a variety of typefaces and colors, are hardly distinguishable from Fernand Léger’s colliding shapes, which appear throughout the collaborative volume.) These are books and pages intended to be seen but not necessarily read. Left: Fernand Léger and Blaise Cendrars, page from the book The End of the World Filmed by the Angel of Notre Dame, 1919. The Baltimore Museum of Art: The Ryda Hecht Levi Collection of Illustrated Books, Gift of Ryda H. Levi, Baltimore, BMA 2001.444 © Fernand Léger/Artist Rights Society (ARS). Right: Pablo Picasso and Pierre Reverdy, page from the book La Chant des Morts, 1948. The Baltimore Museum of Art: Nelson and Juanita Greif Gutman Fund, BMA 2002.568. © Pablo Picasso/Artist Rights Society (ARS), New York. That the volume produced by Picasso and Surrealist poet Pierre Reverdy—Le chants des morts, poèms (Songs of the Dead, Poems)—lands somewhere in the middle of this continuum probably has much to do with their collaborative process. The poems were handwritten by the author—and elegantly so. Picasso, after seeing a sample of the text, remarked that the cursive was “almost a drawing in itself.” His brushed additions of bright red nodules, looping shapes, and circles occupy the empty areas of the pages, rarely trespassing on Reverdy’s script. The poems are legible, and the artist’s approach to the text could almost be said to mimic that of an undergraduate annotating their textbook: Picasso underlines and parenthesizes with bold strokes that respond to the emotional tenor of particular lines. He said he avoided figurative imagery so that he wouldn’t interfere with the “curved quality” of the poetry; in doing so, he deferred to the bookness of the collaboration. Alas, those eminently readable pages go unturned in their case. But in the library with Rena, I was able (carefully, my potentially messy pen replaced with a pencil) to page through a luxurious volume that combined Robert Motherwell’s art and Rafael Alberti’s poem “Motherwell’s Black.” The book is complexly built with foldout pages and irresistibly touchable deckle-edged parchment and thickly inked with swaths of color; its material essence is palpable and therefore meaningful. Turning each page involves removing a protective slat of paper and slowly unfolding the sheet to full size. The ritualistic quality of our “reading” suggested occasions in a distant past when books were rare and one-of-a-kind, when reading was done at a podium in cloistered circumstance (think depictions of Saint Jerome) or in churches with high ceremony. We moved through the book enthralled yet deliberate as its allures evolved from page to page. Later, back in the gallery looking at the beautiful array of barely opened volumes under glass, I felt even more forlorn wondering about the unseen pages, the unfelt textures. But knowing myself to be the sort of person who has stained nearly every tie I’ve owned, I was also glad these beauties were out of harm’s way. Spilling wax on a two-dollar used book did make for a homey talisman. I doubt some errant contribution to Picasso would cause as much delight. Albert Mobilio’s book of short fiction, Games and Stunts, was published last spring by Black Square Editions. “Off the Shelf: Modern and Contemporary Artists’ Books” is on view at the Baltimore Museum of Art through June 25, 2017.